I was going to post this, good thinng I searched. I saw it on Gizmodo.com so I see it's making it's rounds. Too bad they never really show the final product, they just seem to start taking it apart. Fantastic, that song was annoying. 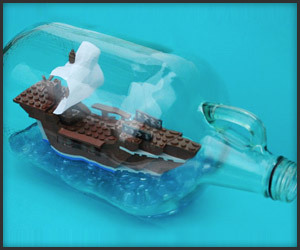 Now I know what do do with my empty bottles of rum. She must have a lot of patience to pull this off. BigCam, I totally agree with you. Such slow-motion videos really tend to "skip" the finished product, that's moderately annoying. By the way (@OP), I'm sittin' here in Austria and for me the video works. Kind of strange that it doesn't show in your country (Germany).